What are drop 2 voicings? As it is shown in the example below, when you drop the second highest note of a Cmaj7 close voicing (bar 1), you get a drop 2 Cmaj7 voicing (bar 2) spelled 5 - 1 - 3 - 7. It has the fifth in the bass so, it be named Cmaj7/G (C major seventh G in the bass), making it the second inversion of the root voicing ( R - 5 - 7 - 3). You can see in the third bar, the same voicing, but on the first , second, third and fourth string, it is much easier to play on the guitar. How to play Drop 2 voicings on guitar? 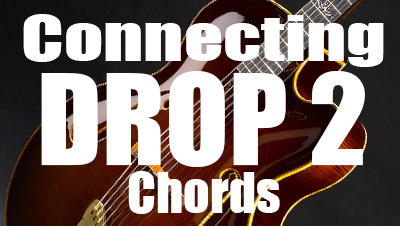 It is possible to play drop 2 voicings on 3 groups of strings. The first group includes strings 1, 2, 3 and 4. The second, strings 2, 3, 4 and 5 and the third, strings 3, 4, 5 and 6. For simply learning the following drop 2 guitar shapes are played on strings 1, 2, 3 and 4. It is up to you to transpose these drop 2 positions to the group of string of your choice. The following guitar diagrams are divided into 5 categories, related to the 5 main chord types used in jazz, namely : Major seventh (Maj7), minor seventh (m7), dominant seventh (dom7), minor seventh flat five (m7b5), and diminished seventh (dim7). Each shape starts with the root position (R-5-7-3), which is followed by the three inversions, 3-7-R-5, 5-R-3-7 and 7-3-5-R.
Now take time to familiarize yourself with these drop 2 chord shapes below. In a first step you have to play theses shapes, one by one, knowing the name and the quality of the chord. You have to know where is the root, the third, the fifth or the seventh of each drop 2 chord you are playing. You can even try to play them following the circle of fifths. We Will see later in the lesson how to build a chord melody with these drop 2 voicings. Major seventh chords are built with root (1), major third (3), perfect fifth (5) and major seventh (7). Dominant seventh chords are built with root (1), major third (3), perfect fifth (5) and minor seventh (b7). Minor seventh chords are built with root (1), minor third (b3), perfect fifth (5) and minor seventh (b7). Minor seventh flat five chords are built with root (1), minor third (b3), diminished fifth (5) and minor seventh (b7). Diminished seventh chords are built with root (1), minor third (b3), diminished fifth (b5) and diminished seventh (bb7). Now we will talk about the subject of this topic, which is how to connect drop 2 chords to create a chord melody. For this we need to take the four maj7 voicings previously seen and try to put notes from the major scale between each drop 2 chord. First, let's remember the major scale formula which is 1-2-3-4-5-6-7 giving the F major scale F-G-A-Bb-C-D-E. The root of the F major scale will be the root of the first Drop 2 voicing. The third of F major, which is A, will be the root of the first drop 2 inversion (3-7-R-5). The fifth of F (C) will be the root of the second drop 2 inversion (5-R-3-7) and then, the seventh of F (E) will be the root of the third and last inverted drop 2 chord (7-3-5-R). The other notes, the second (G), the fourth (Bb) and the sixth (D) will serve as passing tones to connect the chords. Please note the name of the chords, the first inverted drop 2 chord is named Fmaj7/A, the second is Fmaj7/C and the third is Fmaj7/E. This second exercise takes the same chords and same notes but with the melody on the third string. Same chords and same notes with the melody on the B string. Once again but the melody is played on the high E string. Since the degree II of the major scale is a minor chord, we can build a chord melody with drop 2 minor seventh chords. Example with the F major scale. The ii chord of F major is G minor, so we will try to connect G minor seventh drop 2 chords following the F major scale. Respecting the drop 2 minor 7 root formula which is R-1-b3-b7 we will get three other inverted voicings : b3-b7-R-5, 5-R-b3-b7 and b7-b3-5-R thus giving four minor seventh chords named Gm7, Gm7/Bb, Gm7/D and Gm7/F. The passing notes will be A, C, E and G. We will start connecting these drop 2 minor voicings from the root chord, Gm7 (G-D-F-Bb). Given that there are two other minor degrees in the major scale (iii and iv), it is recommended to do the same exercises starting from these two degrees. Try now to play the melody on the first, second and third string three keeping the same drop 2 minor seventh chords as previously discussed. The last example is to connect four drop 2 Dominant chords by using notes from the C major scale (can be seen as G Mixolydian). Since G7 is the V chord of the C major scale we will play G7, G7/B, G7/D and G7/F respectively the drop 2 root voicing, the 1st, the 2nd and the third inversion.